Labour plans to tighten laws on hate crime. 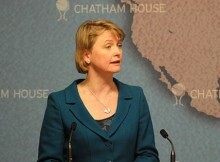 The shadow home secretary Yvette Cooper is set to attack the government for what she believes is its lax stance on hate crime, as Labour prepares plans to tighten the relevant law. Under the scheme homophobic and anti-disability hate crime will be upgraded to aggravated criminal offences, bringing them in line with racist crimes, and guidance on the use of applicable criminals records in sentencing will be altered. Speaking later this week, Cooper will say: “Hate crimes have no place in modern Britain. No one should fear being attacked because of their religion, their sexuality, the colour of their skin or their disability. As well as considering changes to legislation Labour also plans to “teach equality” in schools, with a renewed focus on “understanding and respecting” differences of race, religion, sexuality and disability. Cooper will also criticise the social media platforms, such as Twitter and Facebook, for their slow response to reports of people insulting and threatening each other online, as well as the spreading of “abhorrent ideology”. In response the party plans to write new police guidance for preventing hate crime online, particularly anti-Jewish and anti-Islamic offences.